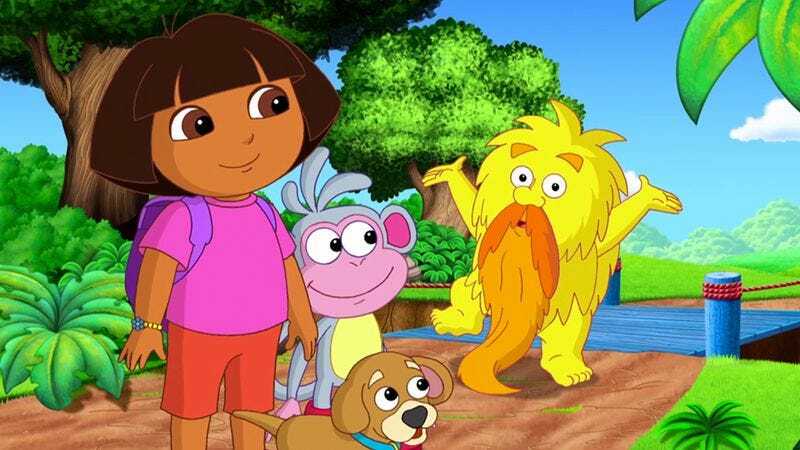 Are you looking for a live-action Dora The Explorer movie? Here’s where we pause, ala the bilingual adventurer herself, to give you a chance to respond (in the negative, presumably). Well, regardless of your answer, Deadline reports that, in a move that proves that College Humor sketches can come true (especially if they involve sidelining Judy Greer), Paramount is developing a film adaptation of the Nickelodeon show. The studio has brought on Tom Wheeler to pen the film—no details on the plot have been revealed, but Wheeler did write the Shrek byproduct, Puss In Boots, so he’s at least got some experience weaving Spanish words into mostly-English dialogue. But the publication notes that Disruption Entertainment, led by Mary Parent (The Sponge Bob Movie: Sponge Out Of Water), is looking to turn the Spanglish stories of a smart, resourceful, seemingly orphaned girl (why else would she talk to maps and monkeys?) into a franchise. “Picture a Latina Hermione, only more isolated,” is how we imagine the pitch went. Wheeler will also be writing a live-action movie based on the Micronauts toy line and its pertinent stories. The adaptation, which comes from J.J. Abrams’ Bad Robot Productions, had previously tapped Zombieland writers Paul Wernick and Rhett Reese for the screenplay in 2011.